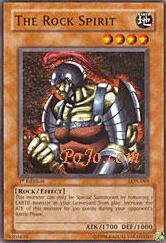 This card is mainly used if the majority of your Monsters are Earth Monsters. You can get one hit kills if you have a pretty good hand. The ability to Special Summon it is really good as you still have your Normal Summon for the turn. This allows you to summon a lot of Monsters in the same turn (especially if you also have cards like Monster Reborn). Just attach United We Stand and you might have game won right there. Other than an Earth Deck though, I don't really recommend playing this card. This monster can only be Special Summoned by removing 1 EARTH monster in your Graveyard from play. Increase the ATK of this monster by 300 points during your opponent's Battle Phase. Anaylsis: Back, with this week looking at The Rock Spirit. One of the many common monsters in LON. This however, is not that bad. It is a 2000 monster (including effect), which is not that bad. However, you have to remove an Earth Monster, which means it can be hard, and likely this monster won't stay on the field that long since it's only a 2000 monsters. With monsters like Goblin Attack Forces, and powerup monsters lurking, it may not be worth the cost. The effect gets worst, since the effect only works on opponents turn making it hard to ATK into monsters like Gemini Elf and Kycoo. Overall the card is not that bad. Earth monsters are very popular, but 2000 ATK points does not keep up with the environment in my opinion. Rating: Pretty decent card for a common. Could be better, but then would be way more rare. It gets a 2.8. It can be useable card, but can be a lot better. Conclusion: Maybe there are better Rock/Earth monsters.